Somewhere I came across this quote and saved it to share later. Later came, and I read it again. At first, the words seemed wonderful. And then I realized this is NOT how I want to paint pictures, set a table, or plant a container garden. Ever since I was a little girl I wanted to be an artist. Not in the standing before an easel with a pallet of paint kind of way. Somehow in my heart I derived joy from creating. Even it was re-arranging the items on the end table when I dusted for my mom. Fortunately, my parents, allowed me the creative expression of re-arranging items. One day my dad came home from a sales call to find that I had taken the garden furniture and set it into an arrangement I liked, added a step ladder, and placed six-packs of flowers on all the steps, as well as on empty planter boxes which I had turned on their sides and used as displayers for the six-packs of flowers. The amazing thing to me as I look back, is that my dad didn’t take it all down, or ask me to, either. No…he allowed this seven or eight-year-old girl to have fun with the plants she helped pick at the greenhouse. He simply watered the plants in their places and allowed me to move this assembly around the yard as my creative heart desired. Creativity comes in all shapes and forms. My creativity is more in the spatial vein. And not so much in the pencil on paper vein. What is your creative pursuit? Please don’t tell me you aren’t creative. I believe that it is utterly impossible. Creativity needs to be practiced. And the more you or I try our hands at some creative pursuit…the more creative we become. This great planet we call earth was created by the most amazing creator of all…God. What a glorious creation it is, too. After he created the world…he created man, and woman,…in his image. And since he is the most fantastic creator and we were created to reflect him. Well….we are creative people. So how are you creative? Is it with words? Photography? Numbers? Food? Problem solving? Music? Textiles? Plants? _______? There are a host of ways to be creative. If, by chance, you are still committed to the thought of NOT being creative, let me challenge you. Think about your passions, the things that delight your eye or ear. What is it that makes your heart sing? Like the old Nike slogan… Just do it!!! Today, I am an artist. You are too….if you choose. Today I will be creative. into this blog, the grapevine pyramid I’m in the midst of making, and the photos I take. What will your creative pursuit be today? Whatever it is….first…dip your brush into the heart of God. I hope you’ll consider visiting each day during this 31 day series. 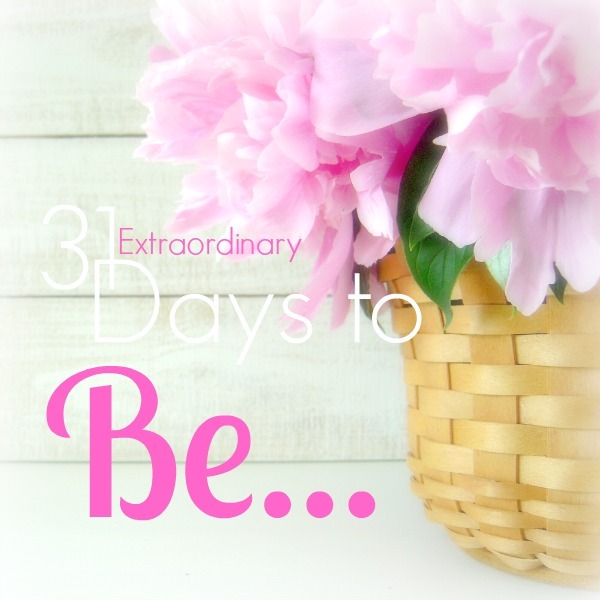 And if you’re a writer, you too can take part with the 31 dayers. Oh AMEN! I am learning to see myself as an artist – a painter, writer, lover of God! Yay!!! I love that artistic you!! And I’m excited for you to be “finding” yourself in HIM. There’s no better place to be. I love your childhood story of fixing the patio!! I agree you still like this type of art and we get the benefits of your efforts via the blog!! Awww…thanks Gwen! 🙂 What a nice thing to say. Oh, what an AWESOME statement about breathing life into your passion/creative side. I’ll send out those cards stacked on the table, put together a wreath for the side door and maybe make that connection with a person or two IF that’s in the Big Guy’s plans. I am in awe of your creativity in relationships. That is truly an amazing God-given gift. Beautiful post, Diane! I love your quote so much more than the original-it’s perfect. I agree we all have a measure of creativity within us because we were created after God himself. Who is more creative than that! We don’t acknowledge that side of ourselves many times or we disregard our own creativity while comparing it with others. That has always been my way of handling things…comparison. And finding myself lacking. I am working really hard during this season in my life to be happy being ME! Oh…ugh…comparison. We all are way way way too good at that. God forgive us. Thanks for popping by with your lovely encouraging words!! Thank you for the inspiration. This is a lovely post. I creatively turned my blog site into fall today! Fall inspiration comes later in Florida! Yay!!! Whenever we celebrate a change of season it’s Extraordinary!! Hope your weekend, Jeannie Marie is amazing! Oh Leena….your words put a smile on my face! 😀 I love it when God uses us to give other the needed encouragement. I love how you re-wrote that quote! I used to say I wasn’t creative. I think it caused a DING, DING, DING in heaven. God put me on a journey of discovering that was a total lie. I’m so glad He did because it helped me discover my passion for photography. It’s so true that we must practice creativity and through that, we get better and better. I’m so glad you discovered your creative side. You definitely have it going!!! Thanks for your encouraging words, too!